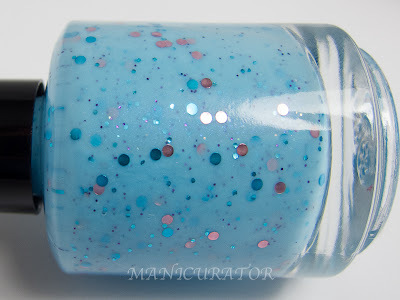 Another gorgeous new collection from Smitten Polish to show you today. 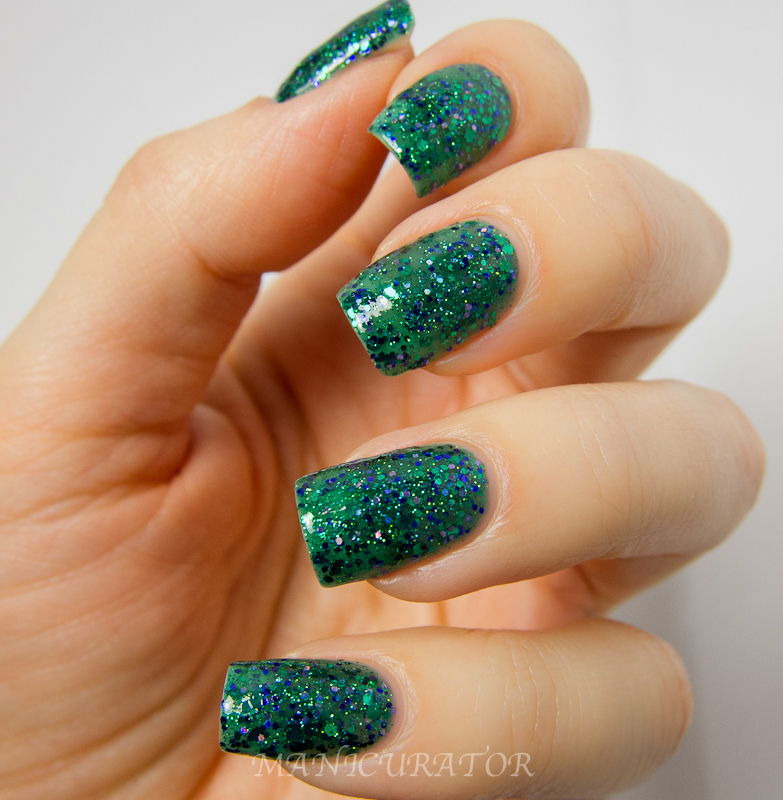 This one inspired by The Wizard of Oz/Wicked. Follow Smitten on Facebook. Noelie has a beautiful blog too, where you can see her own swatches and keep up with what's new. Purchase at her Etsy shop. You can also purchase from Llarowe.com. "Inspired by the jeweled shoes from Wicked and the Wonderful Wizard of Oz, Who Steals a Dead Woman's Shoes?? 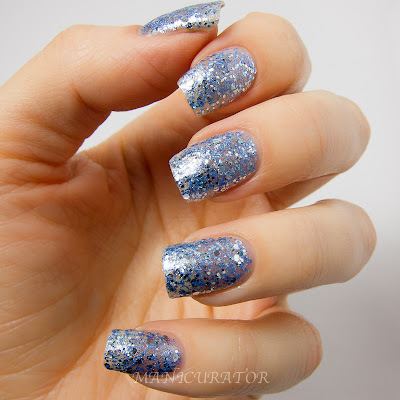 is a confection of silver, pale blue and periwinkle hex glitters in various sizes in a clear base." 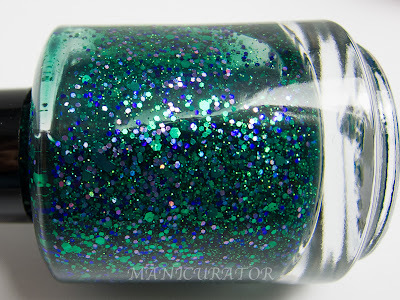 "This polish is inspired by Elphaba, aka the Wicked Witch of the West, in all her green glory. Green jelly base with several sizes and shapes of green and purple glitter, including some green holographic glitters." Three coats here. 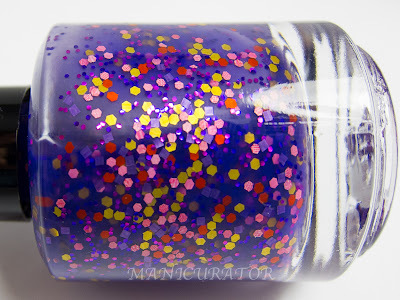 Considering this is a highly pigmented jelly the formula was great. 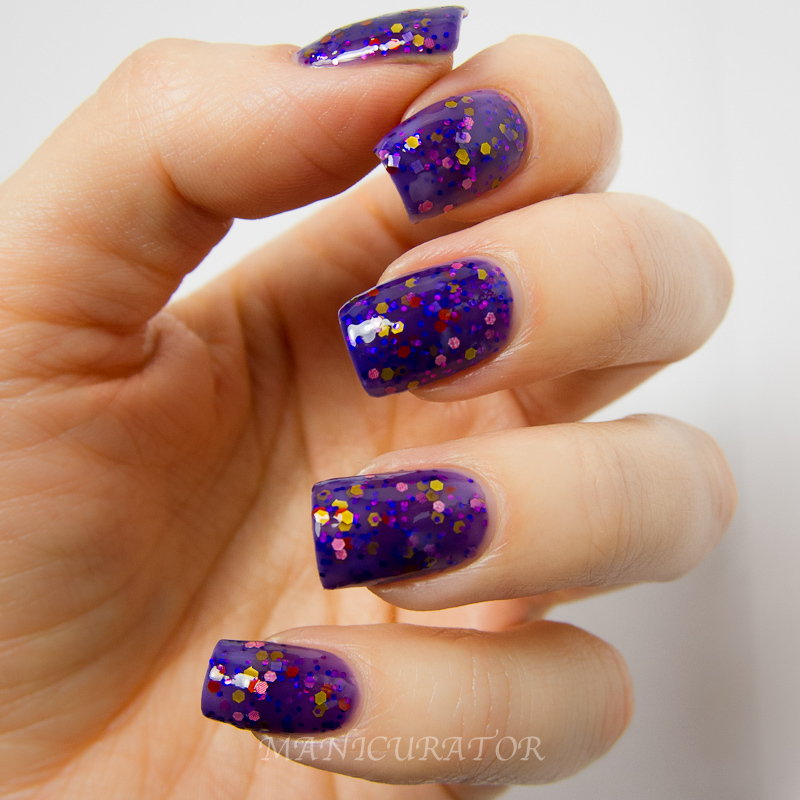 I often find this type of polish gets a little "gummy". This one was not. "Look to the Western Sky is a line from my favorite song from Wicked, Defying Gravity. "So if you care to find me, look to the western sky! As someone told me lately, everyone deserves the chance to FLY!" This is my vision of Elphaba flying off into the sunset." 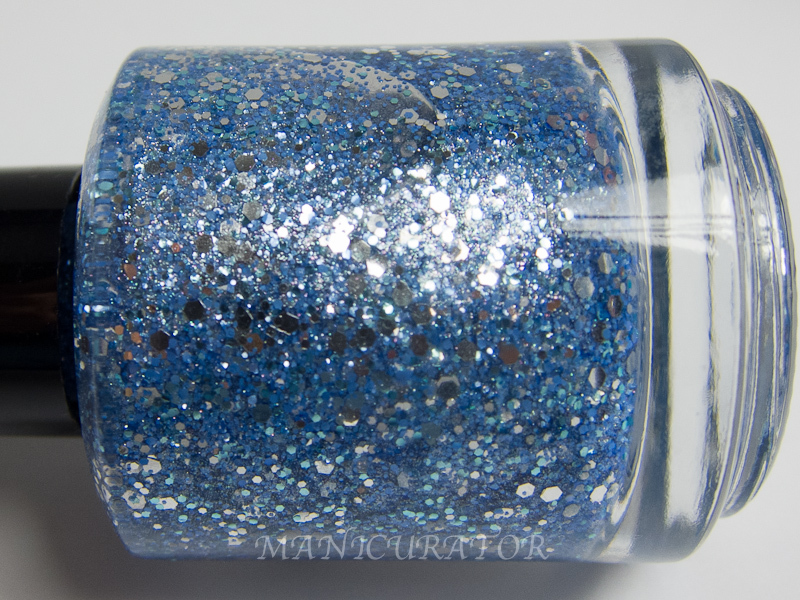 Three coats for this one as well, and it had a touch of the gumminess I mentioned above. "Pink Goes Good with Green! is inspired by the part in the musical Wicked where Galinda decides to make Elphaba her pet project and teach her to be popular. One of the things she does is put a pink flower in Elphaba's hair and exclaim, "Oooh! Pink goes good with green!"" "Traveling by Bubble is inspired by Glinda's preferred mode of travel, the bubble. In the musical Wicked, Glinda's dress is blue rather than pink, but I wanted to have some pink in there as a nod to the movie version of Glinda as well. 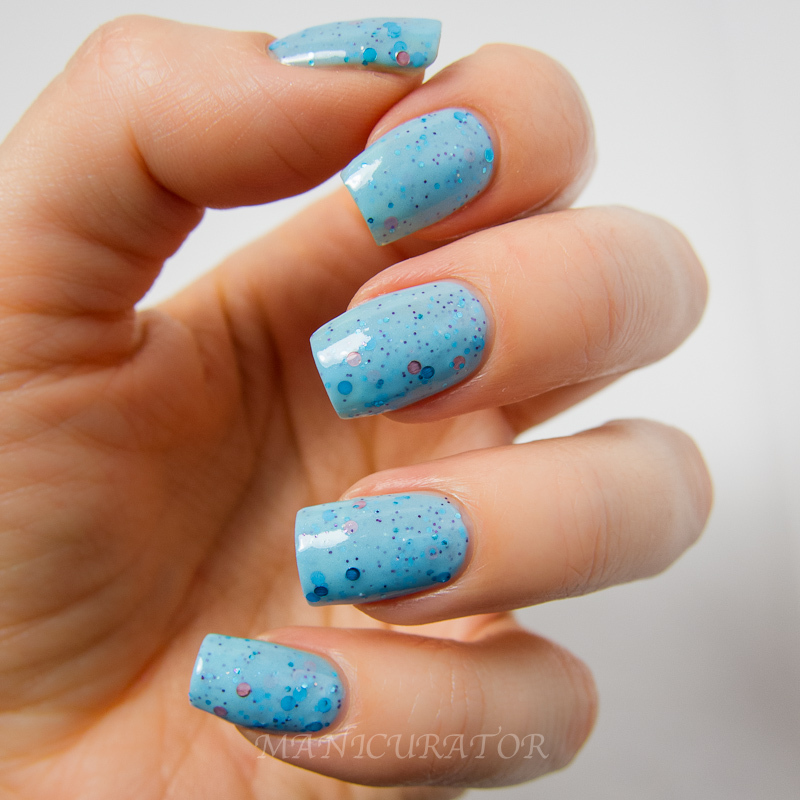 Pink and blue circle glitter, along with a bit of small pink and blue hex glitter, in a milky blue base with a touch of blue shimmer." Hope your week is treating you well! See you tomorrow! Your swatches are always so lovely!! I can't pick my favourite!! They're all so pretty! These are all so lovely! Traveling by Bubble is my favorite..I'm obsessed with circle glitter! On a side note, these spammers have really got to get more creative if they want people to look at their links, huh? 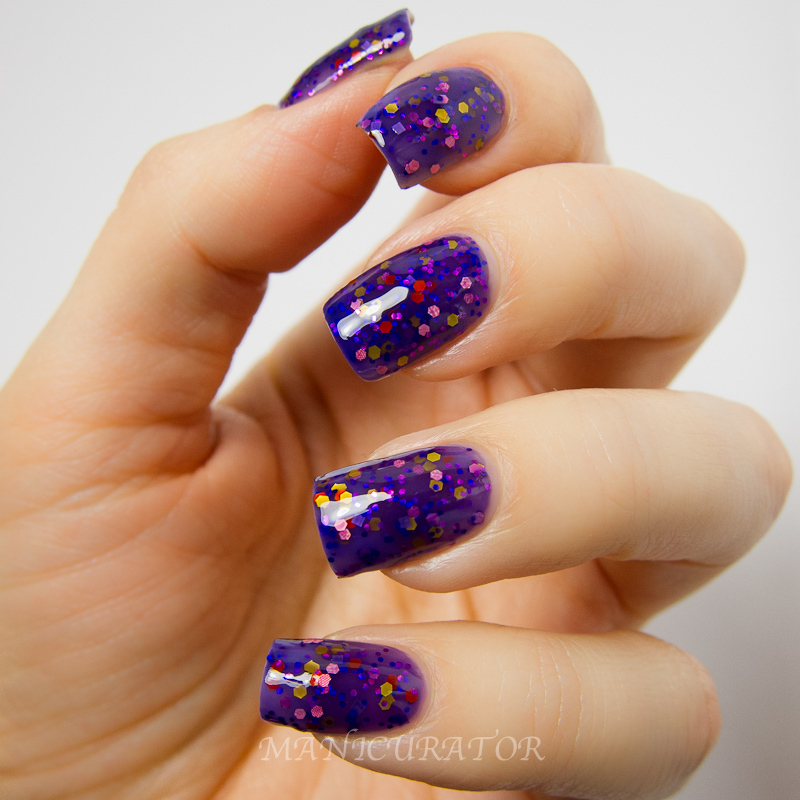 I'm loving the circle glitter too! And ugh! it's bad! Blogger used to filter them out, but now I'm getting at least 5 spam posts a day that go through. I can't keep up :( About to delete them now. Your swatches are always superb! I really can't choose a favourite here. 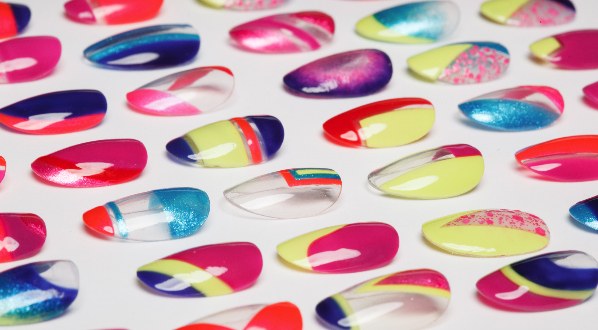 I'm impressed with all of them and I love the jelly bases! I really like Pink Goes Good With Green and Traveling By Bubble. 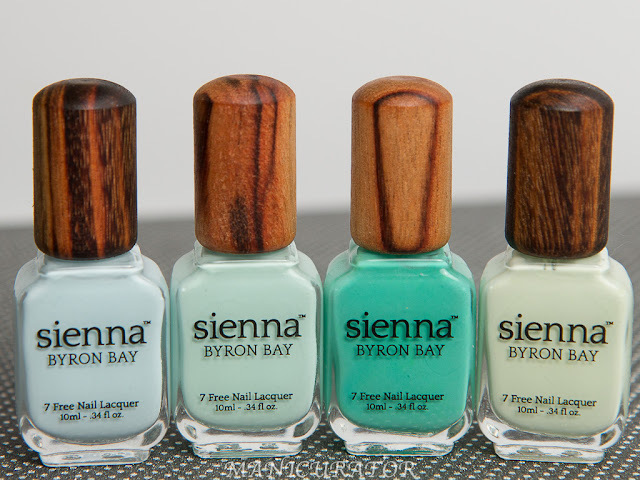 I love these polishes! You make everything look 1000% better :)!